What a winter…let’s hope that Spring is truly just around the corner! Time to order mulch from your Pender United Methodist Men. This is our annual fund raiser to enabling the Pender Men to sponsor short-term mission trips for men from Pender to minister in places like Peru, Thailand, Poland, Paraguay, and Philippi, WV. Funds raised also support local missions including the Pender ReGift Thrift Store, Voices of Youth, FACETS, Western Fairfax Christian Ministries, and other vital Pender activities. This year we will be delivering mulch on Saturday March 21st. Our supplier has maintained their costs, so mulch costs the same as last year. 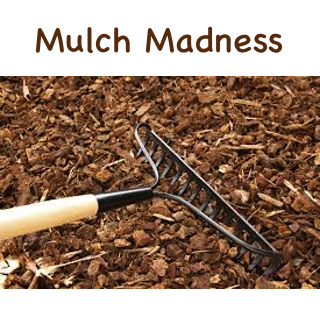 Each 3 cu ft bag of traditional shredded hardwood mulch will cost $4.75 delivered to your driveway. Again this year we will also be offering Shredded Pine, and Pine Mini-Nuggets at the reasonable price of $5.25 per 3 cu ft bag. Volunteers are needed for delivery on Saturday and during the week if available. Also need volunteers with pickup trucks. Please contact Dave Cacner or register to help inside the Narthex or online with your order. Determining the size of your beds. Estimating the number of bags required. We deliver rain or shine (or snow!). Please dress appropriately.